Malia’s fluffy and flirty fringes make for an unforgettable look. Made with 100% premium human hair and Tapered End Technology. All V-LUXE eyelashes include a reusable deluxe sliding lash case..
Nicki makes for a bigger, blacker eye line with its supersized volume. Made with 100% premium human hair and Tapered End Technology. All V-LUXE eyelashes include a reusable deluxe sliding lash case. Chloe, one of the most beloved lash styles in Europe, features long hairs edged with ultra depth—for ultra glam. Made with 100% premium human hair & Tapered End Technology that looks more natural and feels softer than regular lashes. 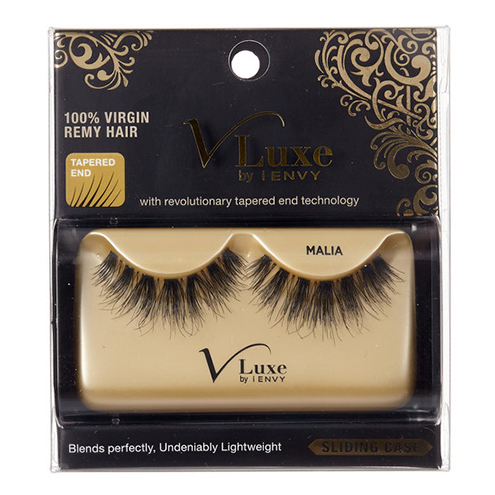 All V-Luxe eyelashes include a reusable deluxe sliding lash case. Dahlia is a sequence of trio-grouped, dark brown lashes for stunning volume Made with 100% premium human hair & Tapered End Technology that looks more natural and feels softer than regular lashes. All V- Luxe eyelashes include a reusable deluxe sliding lash case. Ella starts with a full, natural base extending to a super spiky finish – is sure to be a best-seller. Made with 100% premium human hair & Tapered End Technology that looks more natural and feels softer than regular lashes. All V-Luxe eyelashes include a reusable deluxe sliding lash case. 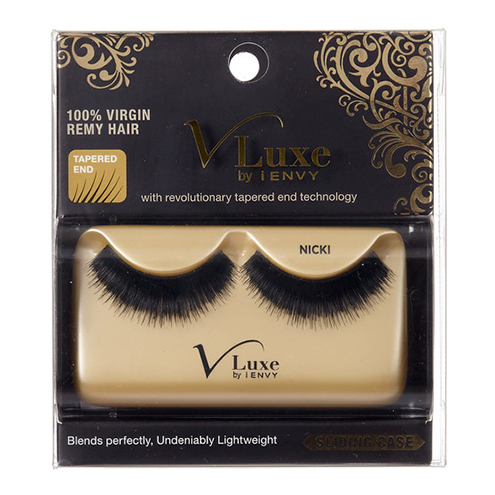 V Luxe 100% Virgin Remy Hair Fancy Lashes by i-Envy (Kiss) has tapered End Lash that looks more natural and feels softer than regular lashes. Fancy lashes creates darkly dramatic look, featuring winged-corner edges for a flirty touch. These lashes are significantly lighter in weight than traditional lashes, the wearer can barely feel them on. Grace is a popular lash look in the US, featuring crisscross design and voluminous style—wow! Made with 100% premium human hair & Tapered End Technology that looks more natural and feels softer than regular lashes. All V-Luxe deluxe sliding lash case. Hannah is a full and lengthy, natural-looking lash; lots of volume that will look like your own. Made with 100% premium human hair & Tapered End Technology that looks more natural and feels softer than regular lashes. 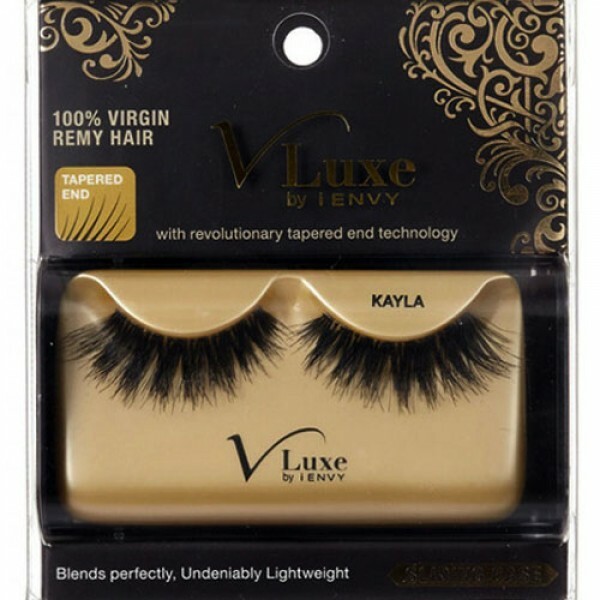 All V-Luxe eyelash includes a reusable deluxe sliding lash case included. 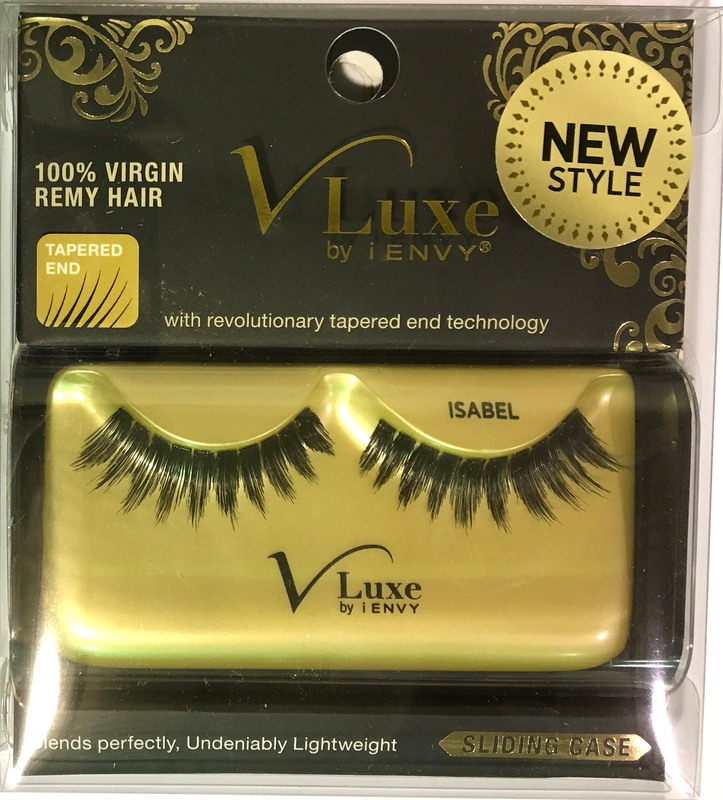 V-Luxe by i-Envy 100% Virgin Remy Hair Isabel Lashes is created with unique bundle style knotting featuring the perfect level of fullness and glamour. Isabel lashes is mde with 100% premium human hair & Tapered End Technology that looks more natural and feels softer than regular lashes. All V-Luxe eyelashes include a reusable deluxe sliding lash case. 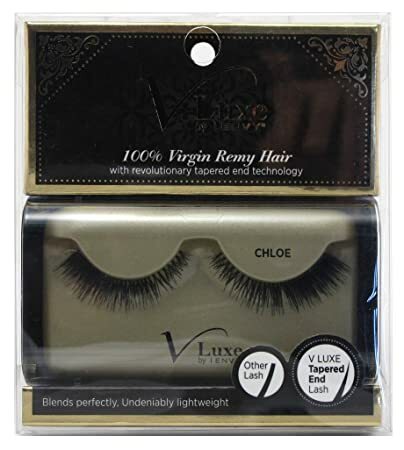 V-Luxe by i-Envy 100% Virgin Remy Hair Isis Lashes is created with unique crisscross knotting featuring the perfect level of fullness and glamour. Isis lashes is mde with 100% premium human hair & Tapered End Technology that looks more natural and feels softer than regular lashes. All V-Luxe eyelashes include a reusable deluxe sliding lash case. Jeanette is inspired by the elegance that is SWAROVSKI, featuring the brand’s crystal set on long lashes with unvarying volume—dazzling! Made with 100% premium human hair & Tapered End Technology that looks more natural and feels softer than regular lashes. 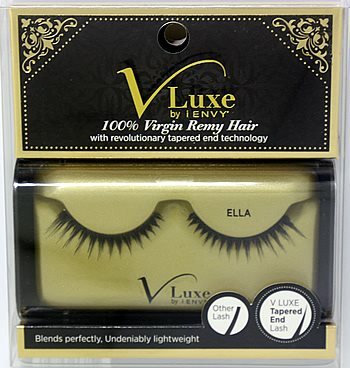 All V-Luxe eyelashes include a reusable deluxe sliding lash case.lashes. Kayla Lashes is created with unique crisscross knotting featuring the perfect level of fullness and glamour. Made with 100% premium human hair & Tapered End Technology that looks more natural and feels softer than regular lashes. All V-Luxe eyelashes include a reusable deluxe sliding lash case.